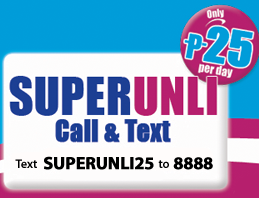 Globe brings back the SUPERUNLI CALL and TEXT, all day call and text all you want for only 25 pesos for 1 day and 150 pesos for 7 days. This promo will surely complete you weekly communication needs without hurting your budget. When you register to this, you are given unlimited call and text depending on the amount you register. It has one day denomination or you can subscribe for 1 week to avoid daily registration. Only P25 for 1 day, you can now call your Globe and TM friends all you want and anywhere in the our country. Just directly dial the mobile number without using any prefix and make sure you have P1 maintaining balance. Only P150 for 7 days you can now enjoy call and text to your Globe and TM friends all you want and anywhere in the our country. Just directly dial the mobile number without using any prefix and make sure you have P1 maintaining balance. 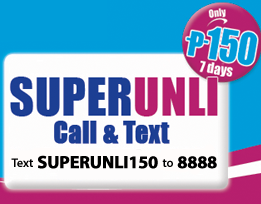 For more info you can text SUPER<space>INFO to 8888 for free.